You roar! I roar! We all roar for dinosaurs during our Prehistoric Preschool Dance Party. Kids can snap those jaws and move those claws during a dinosaur-themed preschool dance party at 1 p.m. on Monday, Feb. 25, at our Main Branch. Children can have a pre-hysterical time with an afternoon of dancing, moving and grooving. The party is open to all kids (two to six years old) and free to attend. However, we do require registration. You can sign up online or call us at (440) 255-8811 ext. 221. By the way, if you want to host your own dance party at home, we have dozens of albums that you can either borrow from our collection or stream online for free. 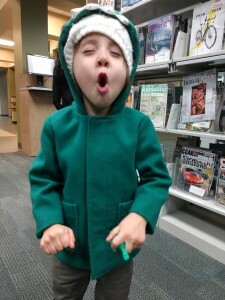 This entry was posted in Uncategorized and tagged dance, dinosaurs, Mentor Public Library. Bookmark the permalink.